A map tool in an operation view allows users to interact with a map widget. For example, the measure tool allows users to find the length or area of a shape that they define on a map widget. In this tutorial, you'll develop, style, and test a buffer map tool. The map tool calculates and displays buffer rings around a point drawn on the map. Before you begin, you must set up your development environment for Windows Operations Dashboard and prepare it to run in developer mode. buffer.json—The manifest file for the extension. A JSON file that describes how the extension should be activated and used in an operation view. buffer.html—An HTML5 file that represents the UI of the map tool that will load when the tool finishes initialization. bufferMapToolTemplate.html—An HTML fragment included in the buffer.html file. The template contains details of the map tool’s UI, and its business logic is included in the BufferMapTool.js file. style.css—A CSS file that defines the style of the map tool. icon.png—A 16px by 16px PNG (or JPG) image file that will be the icon of the map tool. pushpin.png—A PNG (or JPG) image file that indicates the location the user clicked on the map. The recommended size of the file is 15px by 30px. The type property determines the type of the extension, in this case, the extension is a map tool. Make sure the capitalization and the spelling of the words "Map Tool" are exactly the same as shown in the sample above, otherwise the tool will not load. The usePortalServices property indicates whether an extension will use any utility services such as the geometry service configured for the organization. Note: For this map tool to work, this property must be set to true. The runtime object describes the icon (icon.png) and the UI (buffer.html) of the map tool. Their paths are relative to that of the manifest file. 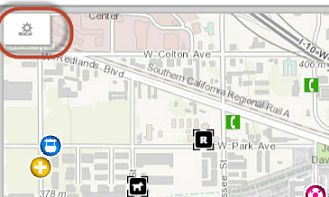 The "viewType" property indicates the type of map tool. In this case, the default map toolbar is replaced with a custom toolbar. To learn more about the manifest file properties, see Manifest file. Between the <body> tags, create a <div> and add a data-dojo-type attribute with the value extension/BufferMapTool. This attribute is used to instantiate an extension/BufferMapTool object that comes from the buffer map tool dijit you'll create in the BufferMapTool.js file. Open the bufferMapToolTemplate.html file, and add the following HTML fragment. It defines the UI of the buffer tool dijit. The UI consists of a label and a Done button. The button has a data-dojo-attach-event attribute that attaches the button to the deactivateMapTool method that will be defined in the BufferMapTool.js file. 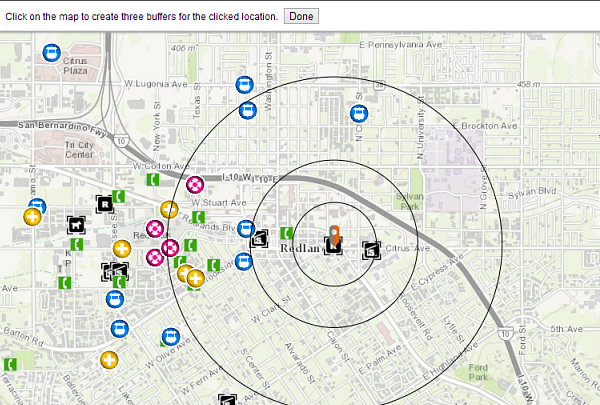 Click on the map to create three buffers for the clicked location. Open the buffer.html file and insert the following <script> block before the closing <body> tag. The script block contains the dojoConfig object that will load the buffer tool dijit. To learn more about dojoConfig, see Dojo Toolkit documentation. Note: Within the paths object, the URI of the extension folder is referenced as "extension". This is used to construct the relative path to the buffer tool dijit (that is, extension/BufferMapTool) in the dojo-data-type attribute of the <div> element in this file. Open the BufferMapTool.js file, and add a define function. This will be used to define the buffer map tool dijit. This function loads the dependent modules and passes the modules as parameters in a callback function. Declare a class name BufferMapTool. The second parameter is an array of super classes that are inherited by the buffer class. The third parameter is an object that contains the methods to be called throughout the lifecycle of the class. 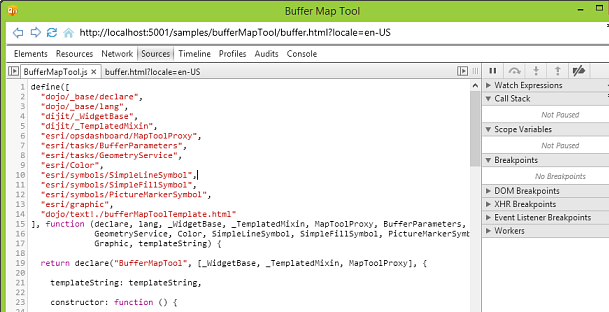 In the BufferMapTool class, load the bufferMapToolTemplate.html into the templateString as an inline string. Insert the constructor function under the template string. bufferParams—An object that captures the configuration options of the buffer rings to be created, such as the radii of the buffers from the point drawn on the map. pushPinGraphic—A graphic for the point drawn on the map. bufferGraphics—Three graphics for the buffer rings. After adding the constructor function, insert the hostReady callback function. This callback will be invoked when Operations Dashboard signals to the extension that the relationship between them is established. // Creates two graphics layers to control the order of draw buffers below the pushpin. Gets the geometry service from the ArcGIS organization, which will be used to calculate the buffer rings. Sets the outSpatialReference in the bufferParams object. Specifies the dimension of the map toolbar. Calls the map widget's createGraphicsLayerProxy function twice to create two temporary graphics layers, one representing the clicked point and one representing the buffer rings. After creating the hostReady callback, add an availableDisplaySizeChanged function. If the width of the map widget associated with the map tool changes, the width of the map tool dijit will be readjusted. Add the mapDrawComplete callback function. This function will be invoked when a user draws a point on the map. It clears any graphics that were previously created after drawing a point, and passes the geometry of the clicked point to the showPushPin and showBuffers functions. The graphics of the pushpin and the buffer rings display on the map. // Clear the graphics layer. Add the showPushPin function. This function sets the geometry of the pushPinGraphic using the point drawn on the map and updates the pushpin's graphicsLayer. Add the showBuffers function. This function calls the buffer function of the geometryService object by passing in the buffer parameters and a callback function. The buffer function calculates the geometries of the buffer rings. These geometries are used in the callback to update the buffer graphics and their graphics layer. Finally, add the deactivateMapTool function. This tear-down function will be called to deactivate the map drawing session and to destroy the two graphics layers when a user clicks the Done button defined in the bufferMapToolTemplate.html file. Note: It is important to destroy any graphics layers that were created in this function. // Creates two graphics layers to control the order of draw buffers below the push-pin. Start Operations Dashboard in developer mode, and sign in to your ArcGIS organization as either a publisher or an administrator. Create a single-display operation view and choose a map. If you create a multi-display operation view, you can only open it in the Windows app, and you won't be able to debug your extension in the web browser. Click the Add, remove, and configure map tools button at the upper left corner of the map. The Configure map tools dialog box displays. Click the Custom button to display the custom map tools. While in developer mode, your extensions can be identified by a red bounding box to help you distinguish them from the extensions created for the production environment. Click the check box next to the buffer map tool, and click Close. The map tool is now included in the map toolbar. Click the buffer tool on the map toolbar. An instance of the buffer tool dijit will be created and the HTML template will load. Click anywhere on the map to display buffer rings around the point you clicked. If you need to debug your extension, you can use the Operations Dashboard extension debugger. Click the Debug button at the top of the buffer map toolbar to launch the debugger. Tip: You can also click Dev Mode in the upper right corner of the app, and click Open Debug Tool to launch the debugger. Using the debugger, inspect the UI elements of the buffer.html file, or set break points to step through the business logic in the BufferMapTool.js file. Note: The URL displayed at the top of the debugger window starts from localhost:<port number> because the extension is running from a local server. Note: Since you're hosting your extension in the local server, you need to keep the Windows app and the local server running.